After finishing The Lord of the Rings, Peter Jackson tackled a remake of his favorite film, King Kong. Jackson’s remake is largely faithful to the 1933 original, while generously expanding the storyline and embellishing some of the characters. Jackson protracts the opening act more than necessary, but his interpretation of Skull Island is amazing. It’s this middle portion of the movie that delivers the movie’s thrills and chills, including Kong’s spectacular fight with three tyranosaurs and a super-creepy ravine full of man-eating bugs. After modernizing the visceral experience of Skull Island, Jackson then delivers a third act that trumps the original film, at least on an emotional level. 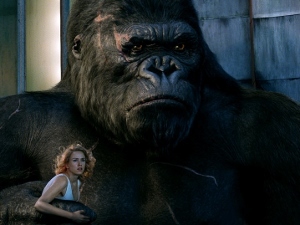 The New York climax and finale pierce the heart of the underlying subject matter — that Kong is a lonely, gentle giant, and that Ann Darrow (Naomi Watts) actually feels for him. In the original film, these ideas are only implied, but here we actually see Naomi Watts jumping up and down, waving her hands, pleading for the airplanes not to shoot Kong off the Empire State Building. Her performance, as well as Kong’s (motion captured by Andy Serkis), make the end of Jackson’s remake a very moving experience. My only complaint with the film is its three hour running time. Thirty or forty minutes could and should have been removed, including several scenes from the first hour and all the scenes involving Jamie Bell and Evan Park. With Adrien Brody and Jack Black.